I remember my dad taking me to the Waltham Cross Empire to see this. I was 9 and my mum was not happy that I was going. My family had only ever taken me to musicals or Disney films so this was an “adult” film and she was fearful I would be traumatized. So I went and as it was a long film, my dad had supplied me with ice cream, drinks and assorted sweets. Returning home, I was violently sick in the car. My mum blamed the film but I knew that it was the cocktail of sugar and more sugar. Some film stay with you for a lifetime. This was one of them and I can remember the whole experience as clear as day. I remember the intermission halfway through (I still remember when it came). I remember the huge argument before the trip and the even bigger argument afterwards between my parents. I remember watching it again at school when the film society showed it and I remember being the only person in the cinema when it was re-released in the early 80s at the ABC Turnpike Lane, when the usherette actually came to my seat to ask if I wanted to buy something. This is one of those films that is so close to my heart, I will defend it to the death if criticized. I know it’s not the greatest film of all time. I know it has its flaws but to me, it is special and like a close friend or a pet or a family member, you will do whatever to stand up for it. Those who haven’t seen it, the story is this. The tallest building in San Francisco is having its opening night. Architect Doug Roberts, returning back after a long time away, soon discovers some shortcuts in the electrics. Financier Jim Duncan refuses to postpone the premiere party being held near the top of the building, even though Doug is not happy with the safety aspect. Then as the party begins, a small fire starts in a closet which soon spreads, leading to a massive fire, trapping all the people in the party and becoming an inferno. The fire department, led by Chief Mike O’Hallorhan, seem unable to control it. This was a huge film. So big, two studios had to get involved: 20th Century Fox and Warner Bros. As with all legendary films, there are legendary stories to go with it, none more so than the rivalry between Steve McQueen and Paul Newman. The pair were the biggest names in cinema at the time and so getting them together would be a force of nature in itself. Under the insistence of McQueen, both were paid the same with the same box office percentage and both should have the same number of lines. The true battle was in the credits. Both wanted top billing so in order to sort the problem out McQueen was left and Newman Right but up higher so depending on how you looked at it, both had top billing. What also surprises is that there was no CGI involved. Everything you see on the screen was real. The sets were real, the stunts were real and the fire was very real. So real that at one point, a set actually caught fire and McQueen helped the real fire brigade to put it out. It’s stories like this that make this film even more appealing. So it has its faults. The scenes before the fire are a little too drawn out as we are introduced to character after character, most who will meet their doom. There are moments that are hard to believe and some of the acting is a little hammy but I can ignore them all as it briskly moves along. For a film this long, it does go at the speed of a train. Regarded as the grand daddy of disaster movies, the 70s were littered with them, from the Aiprort series to Earthquake and the earlier The Poseidon Adventure, another Irwin Allen produced smash, this shows how to get a cracking cast together for a highly entertaining if cautionary tale. It has managed to stand the test of time and has influenced so many other, none more so than the great Die Hard. If you have never seen it, why not? 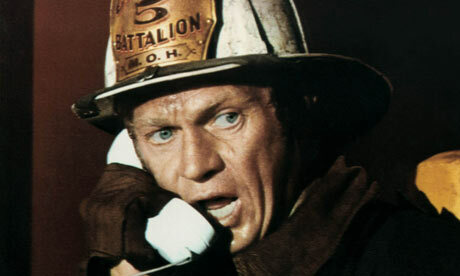 It’s a blast and any film with Newman and McQueen on screen together is worth its weight in gold.